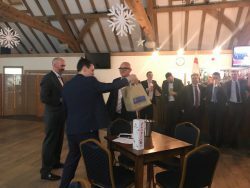 On Thursday 29th November we hosted our final Redhill: Reigate Connects of 2018. This time our bi-monthly networking event was generously sponsored by Wingate Financial Planning. Around 50 people joined us at Old Reigatians Rugby Club in Reigate for drinks and canapes courtesy of our sponsor. 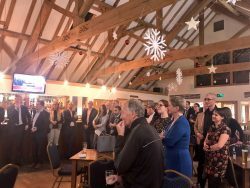 This time around we saw many new faces, as well as our regular guests who all had the opportunity to network throughout the evening and we hope managed to make a few good connections. Mike Jackson, our Business Development and Marketing Director took a moment to thank everyone for joining us before highlighting some of the achievements for Morrisons in 2018. He then welcomed Peter Magliocco from Wingate Financial Planning to say a few words. Peter gave an overview of the services Wingate Financial Planning provide and how they can help and assist in many situations. Before he then introduced the key members of his team who were at R&R that evening, explaining a bit about each of their job roles and inviting anyone to come and speak to any one of them if they had any questions or queries. Mike then stepped back in to assist with the business card prize draw. 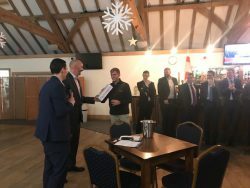 The 2nd prize of the Morrisons goody bag filled with Morrisons goodies, wine and chocolate went to Russ McKenzie from nTrust whilst first prize which was donated by Wingate Financial Planning was a bottle of Taittinger Champagne which went to Ben Hoad from Earlswood Homes. Congratulations again to both of you!